Multishop pro is a twitter bootstrap based responsive theme mainly designed for WooCommerce based e-commerce websites. But this can be used for developing business or personal websites as well as it contains all the features which a standard WordPress theme should have. As Multishop pro theme is built on top of Twitter Bootstrap framework so your website will be displayed on every device (pc, laptop, mobile devices, tablets etc) without horizontal scrolling. It has got custom widgets, theme-options etc in order to get it customized as per your need. Pro version of this theme is also available which has several awesome options like Color options, Font Options , Google Analytics inbuilt code panel, Slider options, more speed optimized code for faster loading and a lot more options to worth having them. The layout of Multishop Pro adapts the screen size of whatever device your visitors are using. This way you offer the best possible web experience to your users, visitors and customers. Multishop Pro comes with UNLIMITED Color option. So you can select the color or the text and hover text as per your branding colors. Multishop Pro has several Font options as well. You can choose fonts which suits your business-type the best ! Multishop Pro is optimized for speed loading hence your visitors don’t have to wait for more than a few seconds to load the page. Multishop Pro comes with home page builder in themes options. By using drag and drop, you can set the home page elements. Multishop Pro has several footer options as well using which you can select 3 coloumn or 4 coloum footer sections. It’s a WooCommerce Ready theme and has Compare Options etc which are not present in the Free Version. Multishop Pro is a SEO friendly theme and because of this your website gets higher rank in Google search results. Basic settings allow you to change color scheme of the theme, Font style, Favicon, Breadcrumbs types and layout of single post. Social settings allow you to add links of your media accounts and display on the pages of the websites, which when clicked, will re-direct to your social media accounts. You can have Facebook, Twitter, Google+, Pinterest and YouTube accounts linked. Header settings of Multishop Pro theme allow users to upload and change logo and logo position for the website with just a few clicks. 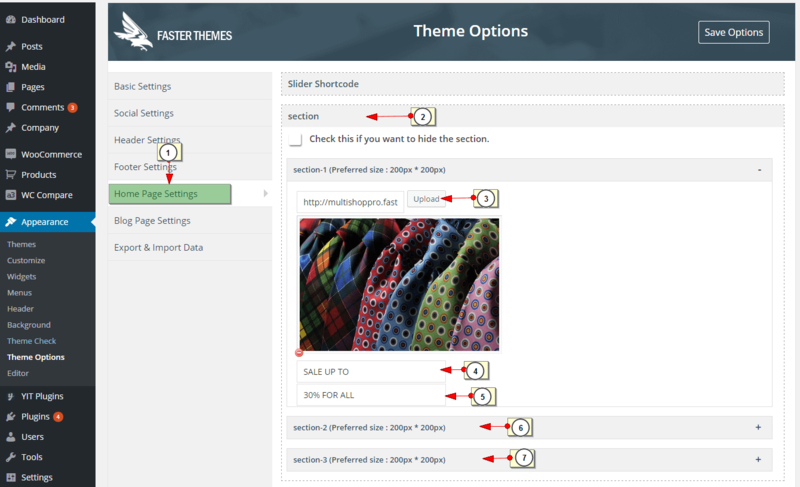 This setting panel allows you to configure the footer of the theme. You can change the footer layout and remove credit link. Multishop pro theme comes with re-arrangable areas (slider, Section, Top Rated Product, Featured Product and Our Brands). All you have to do is simple drag and shift up or down as you like them to display on the Home page front end. Selecting slider section for change will allow you to change home page slider. which will be displayed on the home page. Add slider flow few click to create new slide for home page. Selecting section part for editing will allow you to edit Section image, Section title, Section offer title etc. which will be displayed on the home page. Selecting Top Rated Product section for editing will allow you to edit Top Rated Product Title . which will be displayed on the home page. Selecting Featured Product section for editing will allow you to edit Featured Product Title . which will be displayed on the home page. Selecting Our Brands section for editing will allow you to edit Our Brands Title . which will be displayed on the home page. This setting allows how your blog page will look. The image below states the steps to set how much of the blog content (words) will be displayed as blog post and after that Read more option will be present for further reading if clicked. The option shown below allows you to hide some of the default Blog elements. All you need to do is mark the options and hit Save button. To set up the menu for website, simply follow the process shown in the below image. This is one of the unique features of this theme that allows very easy data migration to new server from development server. All the changes made to the theme can be exported over to new server just with a few clicks.